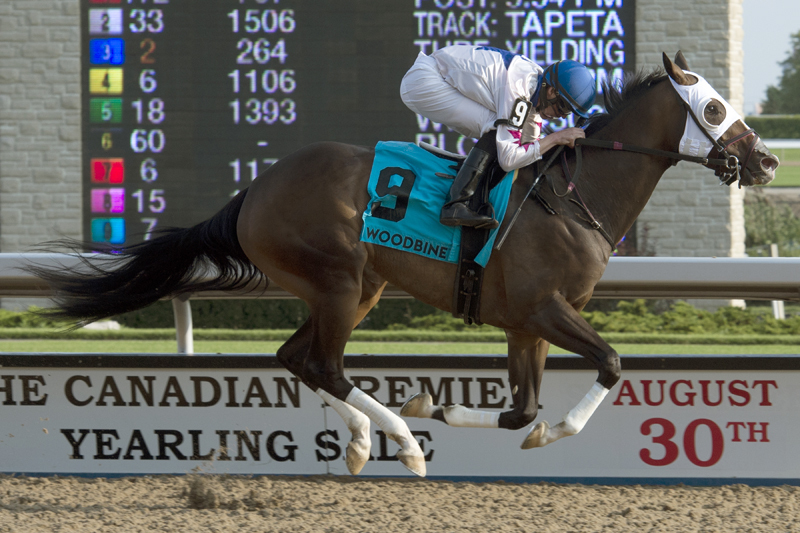 Already a two-time Grade 3 stakes winner this year, Zilli Racing Stable’s Code Warrior is among a dozen distaffers set to contest this Sunday’s $125,000 Ontario Fashion Stakes (Grade 3) at Woodbine Racetrack. Trained by Mike De Paulo, Code Warrior is back at Woodbine, where she won the Hendrie and Seaway Stakes earlier this year, and heads into Sunday’s six-furlong main track feature after a demanding seventh-place run in the Grade 2 Presque Isle Downs Masters Stakes on September 17. “Last time, we were on the lead and set some pretty fast fractions and she had just run the fastest she’d ever run in her life,” said De Paulo, referencing Code Warrior’s 94 Beyer’s Speed Figure in the August 26 Seaway. “We had to ship her and she gave up some weight to some of those horses so there were a bit of difficult circumstances around that race. The Society’s Chairman mare, who is three-for-seven racing this year for De Paulo, had opened her five-year-old campaign also winning the Abundantia Stakes at Gulfstream Park. She sports a career record reading 7-4-3 from 22 starts and is approaching the $500,000 earnings mark. Jesse Campbell will retain the mount on Code Warrior after partnering up with the mare for her last two starts. Trainer Josie Carroll will send out a dynamic duo of distaffers with Moonlit Promise attempting to defend her title in the Ontario Fashion and last year’s Breeders’ Cup Filly and Mare Sprint runner-up Ami’s Mesa looking to return to winning form that earned her Sovereign Award accolades in 2017. Ivan Dalos’ homebred multiple graded stakes champion Ami’s Mesa will have regular rider Luis Contreras aboard for her first start at Woodbine this season while Hill ‘n’ Dale Equine Holdings’ Moonlit Promise will be ridden by Eurico Rosa Da Silva, who also guided the five-year-old Malibu Moon mare to her second Sweet Briar Too Stakes win last time out. Carroll and Da Silva have combined for an impressive five wins in seven stakes starts this year. Moonlit Promise’s initial Sweet Briar Too score had kicked off a three-race win streak last fall that included the Ontario Fashion and Grade 2 Bessarabian Stakes. Dalos also owns Ontario Fashion contender Silent Sonet, who won the Zadracarta Stakes over seven furlongs of turf on July 1 and finished fourth in the Sweet Briar Too for trainer Nick Gonzalez. The field also includes Jessica Krupnick and the graded stakes placed My Miss Tapit, both recently acquired by trainer Norm McKnight and owner Breeze Easy, as well as shipper Marquee Miss, who won Remington Park’s Flashy Lady Stakes last time out for trainer Ingrid Mason and Rags Racing Stable. Blurricane, Just Be Kind, Sugar Jones, Veil and Victory to Victory complete the line-up. Sunday’s 10-race Thoroughbred card begins at 1 p.m., with the Ontario Fashion Stakes scheduled as race eight.